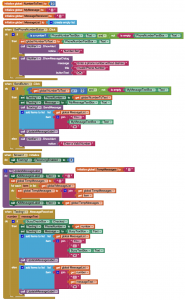 In this part of my App Inventor video tutorial I will provide an App Inventor Texting Example. I have been asked for the easiest way to make a texting app and this is it. The app will allow you to send texts, receive texts, and also send out an alert to the sender if you are busy. I decided to make this app right out of my head to help those people that have questions about the thought process during programming. All of the blocks used can be found below after the video. Here is the finished app if you want it. Do you know of any Apps made with App Inventor that have had any success in the App Store? There are many success stories related to people teaching App Inventor. This has caused students to create a bunch of specialty utility apps that solve very specific problems. I don’t believe there has been a big commercial success app though. I’m sure there have been people that started with AI and then went on to make commercial apps though. Why is that, do you have any idea? Sorry I don’t understand the question? I have watched your videos and tried to learn how to program the blocks to save to a tiny DB on my tablet and display it in a four column table using date, b/p, pulse, and comments as table headings. I am trying to build an app to use as a free download on my website and hopefully learn how to build more complicated apps to use for other medical purposes. I have tried to learn how to do this using pieces of your videos but so far I haven’t been successful in doing so. I don’t understand how to set up the lists and what to use in the initialize screen block. Could you set this up for me for a small fee and is it possible to communicate with you through email since I prefer not to use facebook or other social media at this time? I’ll cover how to do that in my next video since people seem to be having trouble with that. I’ll do it as soon as possible. Another Excellent Video, Thank you. On another note, just your opinion (or maybe you know) Do you think youTube is profitable for Google & what is their business model? just that transparent ad overlayed on the bottom of the video? Thank you 🙂 From what I’ve read YouTube generates over $6 Billion in profit. There are numerous types of ads. I use the unobtrusive transparent ads you mentioned most of the time. After a video has been up for over a month I normally use a pre-roll skippable ad. There are really nasty ads that play every 3 minutes. I have never used them and I never will. Wow, thanks, I didn’t know youTube had different advertising scenarios, leave it to Google to make another fortune off of advertising! Therefore even though I have been constantly study java and all this framework all along for the past 3 years, I still don’t feel confident to apply for a job. can you advise/ help me PLEASE! I’d say the part that people struggle with the most in the beginning is understanding exactly how to model real world objects into Java objects. I did my best to teach that in my object oriented design tutorials. As per Enterprise Java I have found that you can some times meet an unfriendly group for some reason. Mobile Java developers seem to be normally happy to help each other though. If you are struggling with Enterprise why not try mobile instead? I have to turn down 95% of the work I’m offered because very few people seem to be doing it. I focus on helping business owners with private apps which is different from most mobile developers. If you want to go the enterprise route there are a bunch of good books out there, but to get in the door you will more then likely need to do free work to build a portfolio. I finished watching your app inventor tutorials and it’s pretty awesome , I learned a lot from it, but I have one question, How can I make a side bar navigator like the one founded in the play store ? Thank you 🙂 I’m glad you like it. You’ll either have to model something that resembles what you want, or doctor the app using Java. 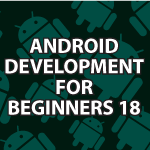 By the end I show how to convert from App Inventor into Java Android.